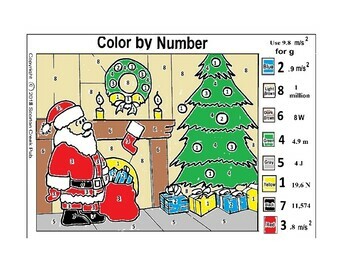 Solve Santa's problems and color the picture .I use 10 m/s2 for "g" throughout. Example problems include: 1. 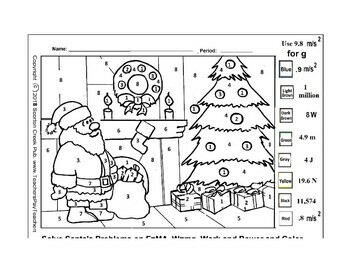 Santa has a package that weighs 2 kg. How many newtons is that? 2. 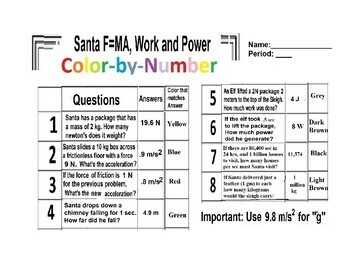 Santa slides the box across the frictionless floor with 100 n. What is the acceleration? 6. 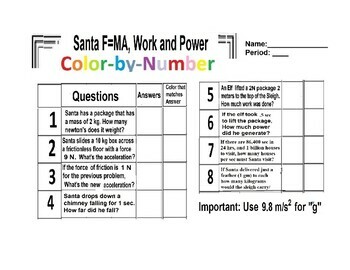 An elf lifts a 2 kg package 2 meters high to the top of the sleigh, how much work was done? I have added an extra easy page that gives the equation for each problem for the weaker classes.